June is a great month for whale encounters, especially humpback whales. 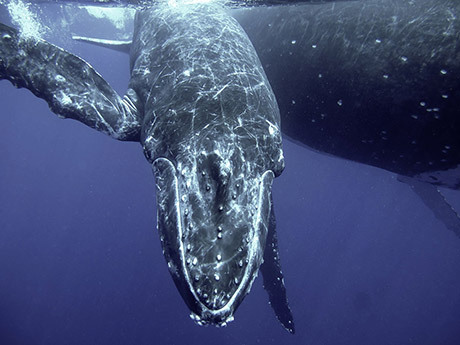 These giants of the ocean migrate during June and divers can enjoy them in Australia and the Galapagos Islands. The Galapagos Islands are magical in June, with numerous whale sharks as well as the humpbacks. Divers can also enjoy the beginning of the Galapagos dry season. The calm seas and great visibility at Australia‘s Great Barrier Reef in June make it a perfect destination at this time of year. It is also a whale hotspot, with dwarf minke whales migrating through the reef each winter. It is the only location in the world where divers and snorkellers can jump in the water with these whales. Humpback whales are also spotted frequently in June but swimming with them is not allowed at the Great Barrier Reef. Divers can instead enjoy listening to their song and watch them breach. The curious whales will sometimes even swim over to the boat. The dive season for Socorro is coming to a close in June and is worth visiting before the season ends. It is a great destination in Mexico and can only be reached by liveaboard from the Baja Peninsula. It isn’t the place for coral reefs, but it is the place to enjoy dive experiences with large marine life such as dolphins, tiger sharks, hammerheads, Galapagos sharks and more. The diving is deep with currents and is best suited to intermediate and advanced divers. Elsewhere in Mexico, the Sea of Cortez season is just around the corner, beginning in August, and some liveaboards offers safaris to both Socorro Island and the Sea of Cortez, making the most of both destinations. The Sea of Cortez has calm dive conditions and plenty of opportunities to dive with sea lions and pelagics and search for tiny macro life. Article by divers and writers at LiveAboard.com. You can read the full article at Best places to dive in June.